(Translated from Spanish around 1850--blame the wording on the translator, not on Sgt. Gutierrez). "Octaviano Gutierrez retired Sergeant of the National Corps of Artillery, a Mexican by birth, before the justification of Your Excellency, representation makes in due form, that having served thirty one years in the military service, he last year obtained his provisional discharge & finding himself with a numerous family to maintain, he has no other recourse than to solicit a land in which to place a small number of cattle, which he has acquired, and he petitions that there may be given him the place of La Laguna, distant five leagues from Santa Ynez, to the North, praying Your Excellency to give him three square leagues, to settle in said place, for he thinks that only in this manner can he maintain ten children, almost all minors, for he has only one son grown up, all the rest of the family being daughters, and the person representing is in bad health, but my distinguished Chief and Señor, nevertheless if my services can be of any use to Your Excellency, I will furnish them with pleasure, whenever your Excellency may direct. "Wherefore he earnestly prays and beseeches Your Excellency, that in view of the foregoing he may obtain, from Your Excellency's kind heart, the grant of the favor he request, for which he will live grateful. Excusing at the same time, that this does not go on stamped paper, there being none in this place. But, we get ahead of ourselves. The land existed long before the Spanish settlers. Avoiding the current arguments about "the first American", let's generalize and state that Native Americans have been identified as living in California 11,000 to 12,000 years ago. Before the first Europeans "discovered" California there were more than 100 tribes here--some in the northwest part of the State and in the Central Valley. The majority, though, were along the coast in Southern California. Most of those in Southern California lived off marine resources along the coast. One source says there were about 1,000 Indians living along the Santa Ynez River, and we know some ventured onto the Sedgwick Ranch. We know of a camp site and a rock quarry, suggesting that the Coastal Indians visited but did not live here. Spaniards reached California in 1542, but settlement and exploitation awaited the establishment of the Missions starting in 1769. 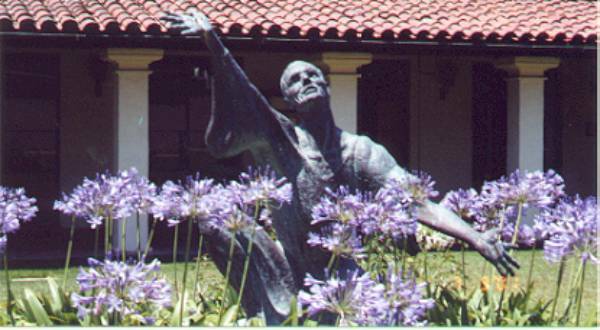 Franciscans built 21 missions along the coast from San Diego to San Francisco. In Santa Barbara County Spain started with the founding of the Presidio of Santa Barbara, April 19, 1782. Then followed the Mission Santa Barbara 4 years later in 1786. and then the Mission La Purisima Concepcion in 1787. Our local Mission Santa Inez had to wait almost twenty years--1804. The land containing the Sedgwick Ranch was part of the old "Mission Lands" of the Santa Ynez Mission. There is no indication that the Santa Ynez Mission had more than a passive interest in the La Laguna region. In the Spanish era there were few Rancho land grants. While Pueblos (Cities) and Missions were granted small parcels, only a few big grants were made. In Santa Barbara County the Ortega concessions along the coast initially from Refugio to Point Conception and later expanded to the edge of Goleta were the only large ones.. There were none in the Santa Ynez Valley. Soldiers were granted rights to graze cattle for a limited period of time. Of the 800-plus rancho grants made in California, the Spanish government granted approximately 30. The remainder was granted by the Mexican Governors of California. We need to digress a bit to see what's going on in Europe that impacts on Alta California. Sedgwick Ranch can be directly linked to Lord Nelson's victory over the Spanish fleet at Trafalgar in 1804. Napoleon was on the rise. Spain was his ally. British naval supremacy after the 1804 Battle of Trafalgar, could not be overcome and Spain was cut off from its American colonies, with disastrous economic consequences. Worse still, France began to act more like a master than an ally. Napoleon assumed direct control and placed his brother, Joseph Bonaparte, on the throne of Spain. The "Peninsular War" as it is known in England really concentrated the attention of the Spanish. While Spain had title to their many colonies in the Americas, their lack of a fleet and Napoleonic and English battles raging across their country meant almost total abdication of control. From 1810 on revolution swept the Spanish empire. (By 1826 only Cuba and Puerto Rico remained under Spanish rule.) While Spain was distracted by the Napoleonic wars and no fleet, the Spanish government in Mexico was distracted by revolution throughout the Americas. They could no longer support the supplying of Alta California. Those distant outposts were not high on the list of priorities. Not only were there no supplies, there were no wages paid to California soldiers . A new period of greater isolation from Spain began. This is an important feature of California history, since it helps explain the later acceptance of Yankees by Californios. ("Californios" is a label for the elite of California). The Californios lost their Spanish identity and never really gained a Mexican one. The main source of money or supplies for the Californios was from trade with the Yankee or English ships. Such trade brought personal contact and social interaction between the Californios and the Yankees. In 1821 Mexico threw out the Bourbons and won its independence and plunged into revolution and counter-revolution. While Spain, before Napoleon, tried to maintain tight control over the edges of the empire, including California, the Mexican government hardly tried. The "colony" was pretty much left to its own devices and own resources. This marked the serious beginnings of the big land grant Ranchos. About 800 were granted--sometimes huge tracts of land. These became the primary wealth of California, replacing the Missions. Agriculture of various types provided a little revenue, but the truly big item was cattle hides. Mexico proclaimed in 1834 the secularization of the missions in California. This basically stripped the Mission of their lands, and hence their wealth. Secularization was gradual over several years. The Governor ordered Santa Ynez secularized in April of 1836, then a change of administrators brought in a friend of the Mission and the old-boy network kept the Mission going for longer. The "people of Reason" headed large families. These families needed brides and grooms, hence the 100 or so controlling families became extremely inter-related. This is an example of the "old boy network" in human history. Mexico City was not immune to the reaches of the old boy network, and the Californio's self selected Governors were duly invested. For example, when Mexico sent Micheltorina to be Governor, Pio Pico & friends sent him back, so Mexico appointed Pio Pico.. The Yankee immigration that had been a trickle from the beginning , became a steady river in the 1840's. President Polk expressed the idea of "manifest destiny" and encouraged the push to the Pacific. But non-Spanish Europeans had to marry into the old families and be Catholic to be eligible for land grants. This brings us back to The Sedgwick. On May 24, 1845 retired Artillery Sgt. Octaviano Gutierrez of Santa Barbara petitioned acting Governor Pio Pico for 3 leagues (about 13,000 acres) to raise cattle and maintain his family. (Refer to the opening paragraphs of this paper). 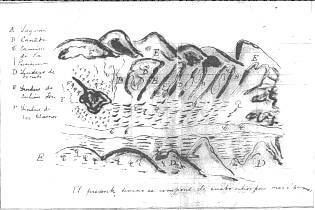 On November 13, 1845 Pio Pico granted the request for La Laguna but identified it as lying between other named Ranchos in the area by a very rough hand drawn map. This is a copy of the actual map accompanying the application and grant. It is not decipherable, and it shows the lack of knowledge of the back country. Hence the long period between the grant and the final definition of boundaries. (This map is not unusual--other grants in the back country had equally vague diseños (maps). 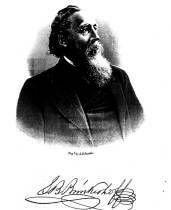 "Pio Pico, Senior Vocal of the Departmental Assembly and provisional Governor of the Californias. "1st He may enclose it without prejudice to the crossings, roads and servitudes and enjoy it freely and exclusively making such use and cultivation as he may see fit but within one year he will place upon it a house which shall be inhabited ……. 2d He will request the proper magistrate to give him judicial possession in virtue of this order by whom the boundaries will be marked out subject to those which are legally shown as boundaries of the lands of Don Julian Foxen, Don Jose Antonio de la Guerra, Don Joaquin Carrillo, and Don Jose Maria Covarrubias. "In consequence I order that being held as firm & valid the present title note be taken of it in the Corresponding Books and to be delivered to the party interested for his security and other purposes. "In the City of Los Angeles on this communion paper for want of that of the corresponding stamp, on the thirteenth of November one thousand eight hundred and forty five. (signed) Pio Pico by Jose Ma. Covarrubias. Secretary"
It developed that the land, as described in words and hand drawn map, were 11 Square Leagues (48,703.99 acres) as surveyed and approved by the US Lands Commission after the Mexican-American War. The conflict between the petition for 3 square leagues and the grant based on neighboring land grants resulting in 11 square leagues took a long time to resolve, to include appeal to the Federal courts and an Attorney General decision to not refer the case to the US Supreme Court. Final approval took the form of a patent from President Andrew Johnson on 17 May 1867. Sr. Octaviano Gutierrez the first owner of La Laguna was a true member of the old establishment (People of Reason). He was also an important man-about-town in Santa Barbara. He came to California in 1816 as a Corporal of Artillery in the Mexican Army. (Gutierrez Street is named in his honor.) In 1827 he married Celedonia Maria Ruiz of Ventura. (Although only a corporal, he was Spanish, a good catch for the Ruiz family.) He was a "town boy", not the stereotypical Ranchero. While conditions of the grant required that he build a house on the land grant he probably did this only sufficiently to validate his claim. He paid taxes only on 12,000 to 25,000 acres. His adobe home was on De la Guerra Plaza, the site of the current City Hall in Santa Barbara. Señor Gutierrez was active in the politics of Santa Barbara and California. He was an Ayuntamiento, a City Councilman in the transition era, and a regular City Councilman in the initial American era and on various boards, commissions and delegations over many years. He also was related by marriage to everyone of consequence in California and had ties to Mexico City. He sank into political obscurity after being ousted, along with his Mexican fellows, from the City Council in a disputed election in 1854 where the Anglos won (like Florida in 2000). But, he appears once again in 1864, appointed to the board of trustees to oversee the conversion of the "Pueblo" to a proper "City". "Political obscurity" does not mean real obscurity. He was a major land owner. His 13(!) children married into the prominent families: Foxen, Carrillo, Hearne, Ortega, Arellanes, Burton and Coverrubio. One assumes a pretty lively social life. After the great flood and great drought of 1861-64 he sold most of La Laguna. He died in 1866 and his wife Celedonia and children sold the remaining portions shortly thereafter. In 1901 one of his unmarried daughters was living in the family adobe in poverty, with a mortgage about to be foreclosed. The City Council saved her by buying the mortgage & leaving her with $200, the house & a small plot of land. The balance of the property was used for the construction of the City Hall. La Laguna didn't share in the glamour era of Californio Ranchos. It was owned by absentee landowners & used primarily for grazing. Señor Gutierrez used it as an investment, but selling one square league on the west side to his son Antonio, who did live on the land, probably near what is now the Firestone Vineyard.. The whole 11 square leagues remained under his and his son's ownership from time of the grant, 1845, to a sale of oil exploration rights in 1865. The first Yankee owner Samuel Brinkerhoff, M.D., also preferred the City life. Social notes reflect his dispatching men to go to the ranch and bring back specimen cattle and horses. So much for the "Viva La Fiesta" "Old Spanish Days" celebrations in Santa Barbara and the "Vistadores" concept. (Not to mean that there is no validity to those romantic concepts--just that they covered a much shorter period of history and smaller portion of the County than we like to think). La Laguna was rolling grassland bisected by valleys. It has since been divided and subdivided into vineyards and ranchets. The original grant is an inverted "U" shape, generally bounded on the south by line marked by today's gate to the Sedgwick Ranch, on the East by the National Forrest, and on the west by Hwy 101 up to Los Alamos. Midland School and entertainer Michael Jackson's Neverland Ranch are part of the eastern lobe of La Laguna land, as is the Sedgwick Ranch. 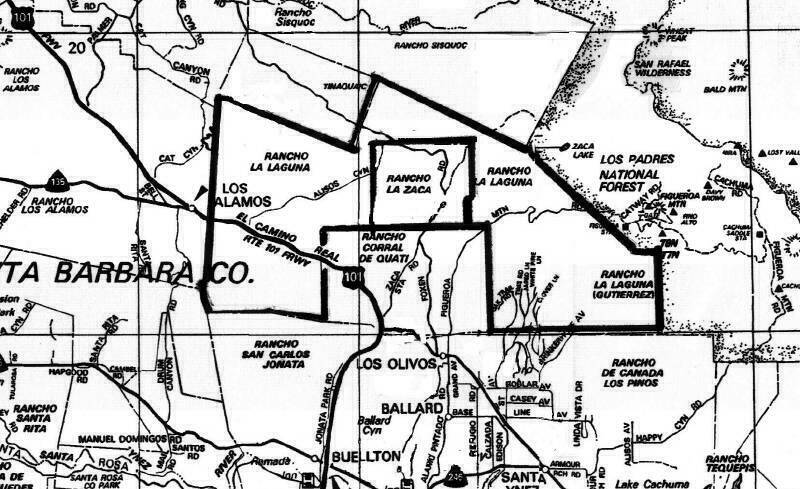 Two smaller ranchos divided the two lobes of La Laguna, Rancho La Zaca (4,458 acres) and Rancho Corral de Quati (13,322 acres). It gets complicated--see the map on the end page . California was Occupied Territory from July 1846 to statehood in 1850 with a military governor. (There were 7 such governors). The treaty with Mexico required that the existing titles to private lands in California be honored. In the era that followed a U.S. Lands Commission was formed to examine and ratify such holdings. Many accusations existed about how these were handled or mishandled to the advantage of Yankees over Mexicans. Before condemnation of this attitude, remember that the US had just fought and won a war against "these people", but agreed to honor real and legal land titles by the treaty of Guadalupe Hidalgo. La Laguna was confirmed to Sr. Gutierrez by the US Lands Commission on 1 February 1853. They addressed the question of whether it was for 3 leagues or 11 leagues and settled on the 11 leagues. That it was settled in his favor probably reflects that he was considered to be a worthy personage. All nine of the major ranchos in the Santa Ynez Valley were confirmed in title by the US Land Commission and subsequently received title or "patent" to the land.. Only two grants, Corral de Quati and La Zaca changed hands before the titles were verified. By 1860 rancheros were already suffering from falling cattle prices, taxes, and litigation. Extensive rainfall in the winter of 1861-62 created a runoff lake approximately 250 to 300 miles long and 20 to 60 miles wide in the Central Valley. Nearly 200,000 head of cattle drowned statewide. This was followed in 1862 to 1864 by the "great drought." Hundreds of thousands more cattle died from dehydration, starvation, and suffocation due to dust inhalation. In one decade, 1860 to 1870, California cattle ranges were reduced from three million head to only 630,000. Unable to sell their cattle for profit, rancheros sold their lands, often at ten cents an acre. By the 1870s, many rancheros had become day laborers in the towns. The combo flood/drought of 1861-64 was disastrous in Santa Barbara county as it was in all California. Goleta slough had been a ship anchorage but became converted to a marsh from the silt.. Streams were torrents. Then the drought. Mass slaughtering of cattle took place on the beach at Carpinteria in 1863, so the offal would wash away, and was followed by other more decentralized killings of the herds. This undoubtedly contributed to the decline of the Gutierrez family fortune. Land sales started with a deed for oil exploration and development (apparently a failure) for $500 to Brinkerhoff and Scollen (Santa Barbara harbor master) in January of 1865. In June the same two partners bought the land connecting the eastern and western lobes of about 5,000 acres for $10. And finally in that year Sr. Gutierrez sold the 20,500 acre eastern lobe of La Laguna to S B Brinkerhoff in 1865 for $1,500, (7.3¢ per acre).. This was the year following the horrific drought and two years before resolution of boundaries and court actions culminating in the Presidential Patent of May 17, 1867. These factors undoubtedly influenced the ridiculously low prices paid by Dr Brinkerhoff to Sr. Gutierrez. In February of 1872 widow Gutierrez filed suit against all, calling for $50,000 plus return of all the land. Later Dr Shaw was dismissed and in October 1879 the District Court in San Francisco awarded her $22,393.66 each against Brinkerhoff and three others for a total of $67,000 plus return of all the land. Dr Brinkerhoff died 6 months later, a financially broken man. Dr Brinkerhoff was born in 1823 in upstate New York. Following the requirements of the time he attended medical school for a very short period and then apprenticed with another MD. He traveled to California at the time of the Gold Rush, via the Panama Canal settling in Marysville but moved to Santa Barbara in 1852. He was the second but primary doctor in Santa Barbara and was active in civic affairs and business affairs in town including construction of the toll road over San Marcos Pass and the Chapala Street Wharf. Brinkerhoff Street in Santa Barbara is known as the antique row. La Laguna was just another business investment. He married Lucy Ann Noyes, daughter of the Hon J M Noyes of Mass Jan 10, 1877. One gets the impression of a very social and civic action man who would never consider living way out in the back country. Business reversals and the court decision on La Laguna wiped him out before death but he was honored with the largest funeral procession Santa Barbara had ever seen. His wife, the former Alice Noyes carried on his real-estate activities, selling and buying back pieces of La Laguna as well as their many holdings in Santa Barbara and as probably pursuing the appeal process on the big adverse decision of 1879. .
Tracing the break-up of La Laguna and making the connection to the current title along with the court award and reversals will be the subject of another paper, .. Bits and pieces we have uncovered, yet to be verified, say that the eastern lobe of La Laguna (of which Sedgwick is about 1/3) remained intact. In 1908 it was purchased by La Laguna Ranch Corp., a group of investors from Pasadena who held it until breakup in 1941. Midland School had been renting their 3 to 5,000 acres since 1932 and bought at that time. It is probable that 1941 is the time Evan S Pillsbury II also bought the parcel we now call "Sedgwick". While Pillsbury is a famous name in flour, our Pillsbury was not of that branch. His father and grandfather were San Francisco based. E.S. Pillsbury II owned ranches in Carpinteria, Nojoque near Buellton, as well as La Laguna. He was noted for raising purebred Hereford cattle. The Pillsburys did live on the ranch and his mother did live nearby on Roblar Ave. He sold the ranch to Sedgwick in 1952. Francis Sedgwick, better known as "Duke," was a younger member of a large, and sometimes wealthy Eastern family. His wife Alice was a daughter of Henry Deforrest and Julia Noyes and his peer in lineage and superior in wealth. He was particularly interested in art and was best known for his sculptures. He gave fifty one percent of the ranch to UCSB a few months before his death in 1967. He had willed his art collection and the rest of the 5,886 acre ranch to UCSB. His wife, Alice , who continued to live on the ranch, modified the will's provisions before her death in 1989 to give her portion of the estate to their children. UCSB and the children then owned the ranch together. This was not satisfactory so an arrangement was made for UCSB to buy the children's portion for $3.5M (25% of the ranch's value). Initially UCSB and the heirs considered developing this land for residential use. UCSB was convinced to retain the property and with the aid of the community raised the above sum (more than 2,000 donors). This was accomplished in December 1997. This transition and resolution was a major political, legal, environmental & social struggle in the annals of Santa Barbara and UCSB. Of interest is that the Francis Sedgwick family first owned acreage in the foothills above Goleta (5100 Cathedral Oaks Road) and later purchased the Rancho Corral de Quati lying just to the west of the current Sedgwick Ranch (near Foxen Cyn Rd & Zaca Station Rd). When oil was discovered on the Corral de Quati, it permitted the Sedgwicks to "move on up" to the La Laguna. Remember that the original La Laguna was 48,703.91 acres and the residual, then still known as La Laguna de San Francisco is about 6,000 acres. A stipulation in Duke Sedgwick's will is that the ranch will forever be known as "the Sedgwick Ranch". As a parting fact that isn't widely known; the last private owner Mrs Alice Sedgwick and the first Anglo owner, Mrs Lucy Brinkerhoff were cousins!! It is doubtful that Mrs Sedgwick knew this, but she would surely have appreciated it. It seems that Alice Sedgwick was the seventh cousin, once removed, of Lucy Brinkerhoff. Their common ancestor was William Noyes of Cholderton. England. Alice Sedgwick was descended from William Noyes' immigrant son, James; while Lucy Brinkerhoff was descended from his other immigrant son, Nicholas. While their husbands were initiators in the purchase of La Laguna Rancho, one hundred years apart, they survived and made their own significant decisions on disposition. Lucy fought court action and won on appeal, and, Alice brought court action and took care of her children. Wall Map (6x8ft) of Santa Barbara County, November 1900 by Santa Barbara Abstract & Guaranty Co, (in the library of the SYV Historical Society Museum, Santa Ynez). Ranchos, Santa Barbara Land Grant Ranches, The Easton Gallery, 1996 Compiled by Ellen Easton. Narrative by Bjorne Rye, Oct 5, 1995. Property of Every Kind, Ranching and Farming during the Gold Rush Era by Lawrence James Jelinek in the Winter 1998/99 California History Magazine of the California History Society. Edie, An American Biography by Jean Stein, 1982, a sensational bio of Edie Sedgwick. California Private Land Claims Docket T 190 Federal Archives in Laguna Nigel La Laguna is T910 roll 24 Docket 331. History of Las Padres National Forrest dated June 1, 1945, typed document located in SYV Hist Socy Library. Wright Title Company Abstracts Abstract for the Tognazzini et al section dtd 1904. In the SYV Historical Society library. Santa Barbara Magazine May/June 1993 "A House Divided, Behind the Sedgwick Ranch Controversy. Obituaries Francis M Sedgwick Santa Ynez Valley News Oct 26, 1967 & Santa Barbara News Press, Oct 26, 1967.